Contentment Vs. Ambition–Should Christians Be Content or Ambitious? I’m going to try a different type of article today, and perhaps a few more times in the upcoming year. I’m going to explore the tension between two valuable concepts, and see if there’s a way to reduce the tension a little. There are two opposite messages our culture tells us, and which Christianity repeats without much additional judgement being applied to these messages. First, we’re told to be grateful for everything we have, since no one gets everything they want anyway. Christianity attaches Paul’s words to ‘be content’ to this idea. Second, we’re told to run after our dreams, and try everything to achieve them. Christianity then attaches the idea of ‘using our talents’ to this concept. But the trouble comes in when you need to decide which one outweighs the other. When are you justified in abandoning one blessing to reach for another? Actually, the fundamental question is this: If there’s something we really, really want, should we teach ourselves contentment because we don’t have it, or develop our God-given talents in order to achieve it? In practice, we answer this question in all sorts of contradictory ways. If someone longs to get married, we don’t usually insist that they must be content to be single, but rather encourage them to keep trying to meet someone. But if someone is bored with their job, we talk about how no job is perfect and even if someone has their dream job they still have very boring things they have to do. Now, there are people who would approach these situations with different advice, but the point still remains—we don’t consistently value ambition over contentment, or contentment over ambition. But what criteria should we use to apply one of these concepts in one situation, but not another? This not a question I’ve ever seen a detailed answer to yet. When we identify something we want, what practical ways should we approach our desire? Let’s explore a few ways of answering this question. First, the goal of our lives, as Christians have declared over and over again, is to glorify God. “Man’s chief end is to glorify God, and to enjoy him forever,” as the Westminster Shorter Catechism says. Second, some desires are easily identified as good or bad, but the vast majority are not, at least not at first glance. Both marriage and singleness are approved of in the Bible, so both choices can be glorifying to God. And if someone wants to become a policeman instead of an electrician, there would be no grounds to argue one job is more good or evil than the other. In other words, the most knee-jerk responses to the question of contentment vs. ambition do not provide much direction. This is frustrating. However, like in most life situations, there is not an easily applied formula to use, but there are certainly principles that help us navigate the foggy paths of life. Another way to answer this question is to look at each of these concepts—contentment and ambition—and evaluate their value. I will do that in Part 2. This post is already lengthening quickly! I’d like to end this post by pointing out the right balance between ambition and contentment matters to me personally. I’m sure it is directly practical to many others as well. As the New Year approaches, you start to wonder what you should direct your energy and talents towards. And to be honest, I struggle with ambition. So much of what culture tells me I should be doing with my life—earning lots of money! changing the world by campaigning for something or starting an organization! proving women’s value by becoming powerful and prominent!—I struggle to summon up much enthusiasm for. However, I struggle with contentment too. Lack of ambition does not equal contentment, because you do want your life to be meaningful. You think if only you could change a few things in your life, you would be happy, because your life would be directed to something bigger than just satisfying yourself. But lack of contentment is not a good thing—it is undeniable that we are commanded to be content. Beyond that, when I examine my desires for what I would have enthusiasm to pursue, it is something either outside my control, or something that is rather unwise to pursue. This little summary makes ambition sound rather negative, and I am sure it is not in every case. So I look forward to tomorrow when I will explore contentment and ambition more deeply! UPDATE: Part 2 is here. *This is not to deny that as one grows in their spiritual maturity, they gain a better understanding of what is glorifying to God. Spiritual maturity helps enormously in life choices. However, I just mean to say this is not a trump card that makes everything clear in every situation. It is deeply frustrating to be told you should know what to do when you actually don’t. Especially when no further advice is provided on what you should supposedly already know. “How often do you meet someone who wouldn’t change a thing about their life? Very rarely will you meet someone who claims that their life is perfect – that they are completely satisfied with how things are going. And that’s pretty universal for each of us. When we look inside we see there is something each of us desperately wants: to be looked up to by other people, to be loved by someone special, to have a purpose in life, to make lots of money. There’s always something not quite right with the way our lives are right now. We might have strong relationships, but those relationships may not be quite as upbuilding, romantic or supportive as they could be. We might have a good job, but we hardly feel we’re making the world a better place by doing it, or that we’re really doing anything worthwhile. Who do we think Jesus is talking about here? Our minds immediately go to fabulously wealthy people like Warren Buffet – or maybe Bill Gates. Do we ever stop and think that maybe Jesus is talking straight to us? We like to think of ourselves as just your average Joes – not exactly rich, but not poor either. We probably don’t own a Ferrari, or blow thousands of dollars on expensive champagne in one weekend. Really, when we look at everyone around us, we’re pretty normal. Just middle class. The fact that our society around us is so amazingly rich blinds us to the fact that we’re amazingly rich. For example, here I am, a university student, getting an education that only a small percentage of the world has the opportunity to obtain. Why should I be born into a situation where university, though still expensive and a lot of work, is within my grasp, whereas for most people it is beyond their wildest dreams? Maybe you’re not in university. But think, exactly what is considered poor in North America? It may be a struggle for many to get by, but some of our poor are still richer than the rest of the world. Add in the social safety nets we have in North America, such as welfare, unemployment insurance, etc., and we have a situation richer than a good majority of the world – or even a good majority of history. Yes, of history. We have riches beyond what even some kings in history could’ve imagined. Access to gigabytes upon gigabytes of information, far beyond what even the great library at Alexandria used to hold. The ability to travel almost anywhere in the world in a few hours, maybe days. The ability to treat multitudes of illnesses people used to die young from. An increase in lifespan to eighty, ninety or even a hundred years. We may not be loaded down with gold, jewels and furs, but our ancestors never dreamed of computers or ipods. And we live in peace. In Canada, where I’m from, we have security we take far too much for granted. Have you ever considered what an amazing thing this is? Coming out of a century that produced two world wars and multitudes of other ones, it is amazing to live in a society that is not up-heaved by revolution, torn apart by civil war, or invaded by another country. To have a stable government (though flawed) that does uphold a certain amount of justice, keeping people’s worst impulses somewhat under control. Why should we be granted peace and stability at all? To illustrate with an example, the city I live in (Edmonton) had a scare two years ago because our murder rate rose to forty-two murders in the year. There are cities in the world that see that many murders in a weekend. Compare this to the riots in the favelas of Rio de Janeiro in 2010, where the government had to send in the army to deal with the drug cartels, who were attacking civilians. Or riots in Syria, where the government itself slaughters its own citizens. Look at us. Safety and security is not something easily visible, and is not often thought about. But we are blessed. Here, we should stop a moment and think about what riches actually are. Material things are very nice and all, but what are true riches? The Word of God, of course. How truly blessed we are! Everywhere in our society there is access to the Bible – Bibles, Bible studies, churches – the Word of God is raining down around us. It can fill every aspect of our lives, if we let it. Yet it’s easier to complain while dragging ourselves to Bible study, or find an excuse to stay home from church. We can send back the finest feast of delicacies, because we know there will always be more food tomorrow. We can take our riches for granted. 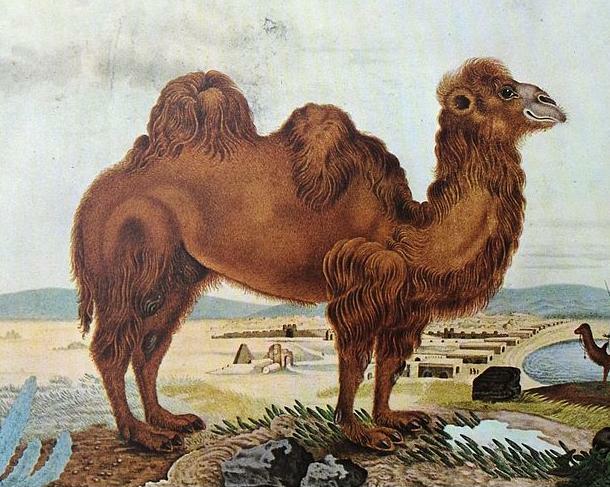 What are to think, then, about Jesus’ words about the camel? Look at our world around us. Is there a possibility our enjoyments, our freedom, our society buffers us from the necessity of having to rely on God? Not that we shouldn’t accept these! I am in no way promoting we all immediately sell our possessions and go live among the poor. But we can’t be blind to how our own comfort interferes with our ability serve the Lord, who has given the great gift of all – salvation – to us. We are insulated from a certain kind of desperation, a dependence that comes from having nowhere else to turn. We’ve never been asked to give up everything, so we don’t think about what we’re hanging onto. Is this reason for despair? Not at all. Those who heard these words of Jesus looked at each other and asked, “Then who can be saved?” But reading a little farther in Luke’s gospel, we come across the story of Zacchaeus – a man who was specifically pointed out by Luke as rich, but who Jesus describes as saved. God can do anything, even save a rich man. Even allow that camel to go through the eye of a needle. And for us, whom Luke might’ve described as rich as well if he had met us, it is an opportunity to open our eyes to how great God’s love is. Let our riches not be a barrier between us and God, but rather be an opportunity to do good and help others, and to show others exactly how much God has done for us. ‘It’s Not a Waste’ was recently published on Powertochange.com! Check out the excerpt below, or the full article here. “Have you ever hit a dead end and discovered whatever career or job or schooling you pursued wasn’t for you? Maybe you’re just not cut out for engineering (or nursing, or teaching). As you attempt to switch directions and you look back over the last year (or two, or three) of your life is one question haunts you. Was it all a waste? I have been there and I can tell you this: It’s not a waste. Let me tell you what happened to me.